This one is amazing, I have had it for almost 2 years now and I have had 0 issues. The setup is super easy and I place 2 different bikes on it. One bike is super light (Speed Allez Bike - 13lbs) which goes on the top one and the 2nd bike is a heavy tour bike (25lbs). The support and the height are fine just need to set the arms properly. Convenient bike storage, great fit in my small apartment. I have only used it for bikes with road frames so I cannot speak to its functionality with a mountain bike but the rack works even better than I thought it would. It is a huge space saver in my apartment and is more sturdy (even with hanging only one bike occasionally) than one would think with a "leaning" bike rack. Works perfectly and easy to put together and attach to wall. Once issue that we had is that it does not work with female bikes 9without a straight crossbar) - not a fault of the product. Just something to be aware of. For the price, this item does what I needed it to do. But I added extra straps that are screwed into the wall behind the bike rack. I don't see how this thing would possibly stay in place if you were trying to pull the top bike down. It is kind of tricky to wedge them in there in the first place, so unless you're 6'4" and ripped (I'm not), I think you would topple this thing over trying to get the bikes on and off with just the one little safety strap that comes with it. Does not support the weight of a steel touring bike and a Trek Madone carbon road bike. Total weight was less than the capacity of the rack. Still it was falling off the wall. It will require the screw on the wall. Should have bought the other version that can hold more weight. This bike rack looked really cool in the photos, but unfortunately fell short. It claims to work for any size bike, but I needed it for 2 beach cruisers and the wider handle bars made it awkward and was not effective. It stuck out further from the wall than I thought, and there is a flimsy strap to attach it to the wall so it doesn't tip over, but the screws were smaller than the holes cut for them, so it slips right out. Could not risk it tipping over onto my car (or myself!) so this goes back to o stock. But o stock customer service great as always!!! love it. Right now its holding only one. Both tires are level in the stowed position, I interlocked the brackets. It's cool. I'm waiting for my new swytch electric bike i'll put on the top rack. Wish the color was white. The finish is powder coated and good. Easy to assemble, I didn't see the directions at first and assembled it by the pictures on the box! This was super easy to assemble and it really frees up space in my garage. Good quality materials and a great price. Easy to assemble. Easy to load bike onto. I only have my road bike on it about half way up. makes it nice to do repairs and stuff. Not sure how 2 bikes will fit. Definitely recommend. No more leaning bike against the wall all year. We love our new bike rack, super easy to install. It’s a great space saver and bikes go on and off the rack easily. I highly recommend this product. Rack came with all parts - delivery on time as stated - easy to install- holds 2 bikes -1 bike weighing 35 pounds the second bike weighing 25 pounds- space saver , bike rack is light weight which makes it easy to put in different locations if you choose to move it . Works well ! Simple construction paired with high functionality has made this storage for bikes an essential in my apartment. It takes up minimal space while allowing for easy bike accessibility, making it the perfect way for us to keep our equipment out of the way and easy to use at the same time. I really love this! I dont have much room in the apartment I live in so this is definitely a room saver. It's super easy to put together too. The only thing I wish is that it came in different colors. The sliver is good for a garage but inside it clashes with my house. 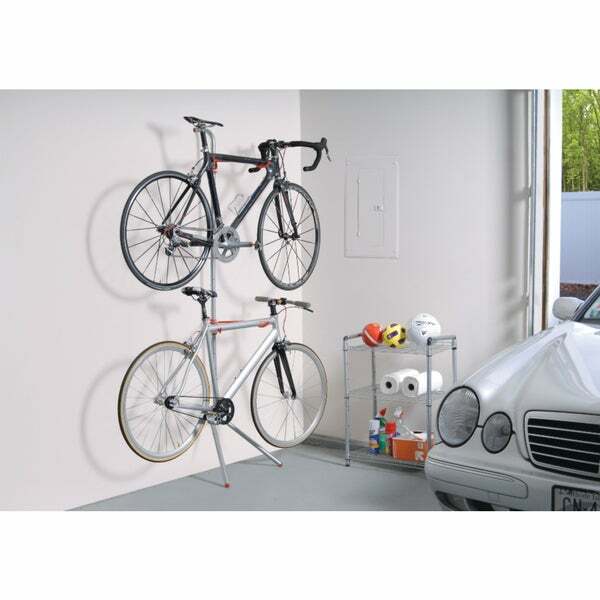 So easy to install and offers a great way to get the bicycles off the ground and organized. I've used it both on wood and smooth carpet, and it doesn't slip on either surface. I usually hold a road bike and mountain bike on it, and have had no worries about them being dropped. If you want extra assurance of its stability, there's a strap that allows you to mount it to a screw at the top. A little complicated in the assembly but once it was up it's very useful. The rack was easy to assemble. I don't like that it is not very stable with two large bikes. Very eat to assemble and functions very well! 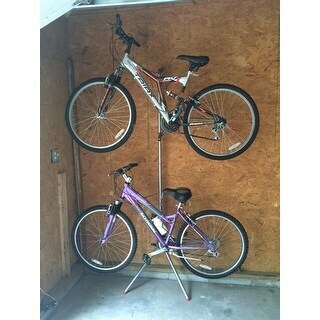 This bike rack works perfectly for our small Florida two-car garage, where storage is at a premium! It's easy to access our bikes and they are free from the risk of scratches, etc. It was easy to install and we are happy with the system! "what is the rack height?" This is approximately 84 inches high x 22 inches wide. "A customer above says the load limit is #17 per hook, #33 per bike, is that true?" I have one bike on two hooks that is a hybrid, so I am guessing it is true. I have no problem with the bike. "Do i have to drill into any walls?" No. The stand leans against the wall. It's stable when holding my bikes and I can easily move it if necessary. And, it works surprisingly well to add to Suzanne's answer. The rack does not require you to drill holes to walls. It has a lean to design. No it leans. Very stable. "Will this work on any floor type? Including Carpet?" Great question! Yes, it should work well on any floor type. 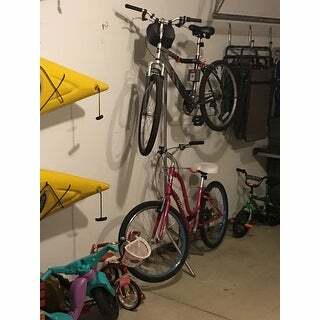 As long as your carpeting is non moveable (no scattered rugs) to ensure a solid base for the bike rack it should be fine, as the weight of the bikes go in a vertical flow and this keeps the bike stand secure. Hope this helps! I really enjoy this stand! "Can it be used to store one bike? If so, would you recommend top or bottom placement?" Hello bentonfam, yes you can store 1 bike on this. What ever option you prefer. Have a great day! I love the sleek design and minimalist detail. I can't wait to see when it arrives!